Idris Elba (Prometheus) and Matthew McConaughey (Dallas Buyers Club) star in epic dark fantasy adventure The Dark Tower, based on the popular Stephen King book series. 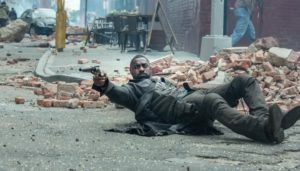 In the film (and series), Roland, the last Gunslinger (Elba) has been locked in an eternal battle with the Man in Black (McConaughey), determined to prevent him from destroying the Dark Tower, which holds the universe together. With the fate of the worlds at stake, good and evil will collide in the ultimate battle. Directed by Nikolaj Arcel, the movie also stars Tom Taylor making his feature film debut, Katheryn Winnick (TV’s Vikings), Claudia Kim (Avengers: Age of Ultron) and Jackie Earle Haley (Watchmen). Though it was highly anticipated, the film didn’t live up to expectations at the domestic box office this past summer, ringing up a so-so $51 million.